Listen, we all know it's coming. Heck, it's practically here. Some (many?) of you are probably wondering why we haven't jumped on that bandwagon quite yet. Not me, though. I can wait. Long time readers probably know that already. Nathan's the basic one, not me. And if you still don't know what I'm talking about, heck, I'm not even ready to write the actual words. But you know them, they're everywhere this time of year. They rhyme with "sumpthin' nice." But nah. I'm sticking with what I'll call "alternative seasonal tastes" as long as I can. It's a long fall ahead...heck, it hasn't even technically started yet. But colder weather is on the horizon, and with that comes great classic tastes like a good cup of hot chocolate. Or, more to the point of this review, Trader Joe's Organic Frosted Hot Cocoa Toaster Pastries. 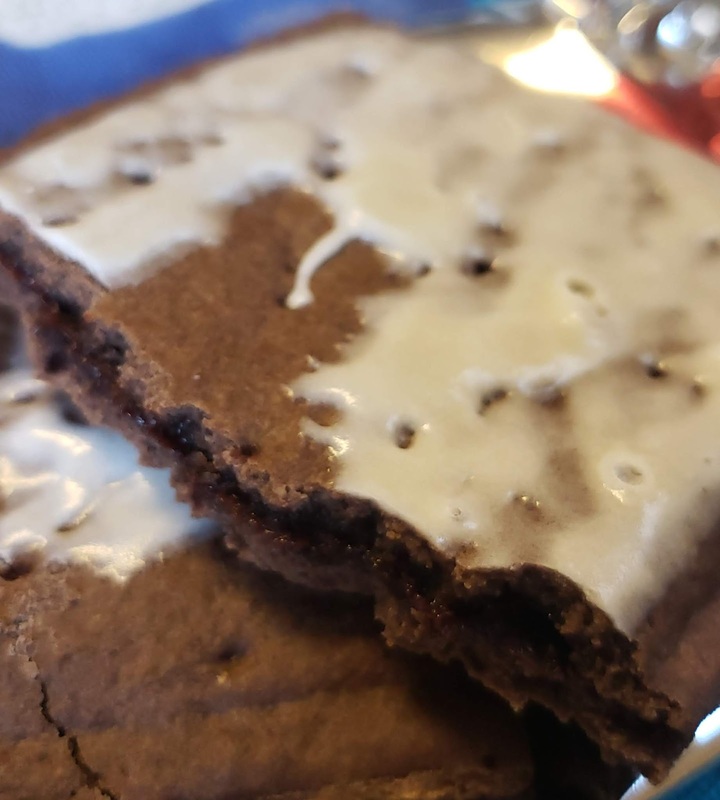 Sheepishly, it was while searching for another seasonally appropriate PopTart compadre that I first spotted these particular TJ's breakfast/snacky pastries. Those other ones were for my beautiful bride, but these? For me. All mine. Gimme all dat cocoa....now! For me, this is the rare toaster tart that actually tastes better toasted than "raw." The key is the filling. At room temp, it's kinda a basic choco-fill, nothing too special. but when toasted, it gets this warm, gooey, fudgy feel that's quite evocative of the dregs at the bottom of a cup of hot cocoa. Except, well, better. It's good filling for sure, and the surrounding dough pouch is appropriately soft and crumbly with just the right feel, whether toasted or not. But there's a small disappointment here. Look at the top. Where's all the frosting? Every pastry we got in our box had this same male balding pattern thing going on. And what's on there isn't quite enough to really taste if it's supposed to be more like some wispy froth type deal, or more of a marshmallow essence. I know this sounds like I'm complaining that there's not enough sugar on my sugar, because I am, but when you're getting a toaster pastry out to mash on down, you know what you're going for, organic or not. If I wanted healthy and good for me I'd make a kale smoothie. 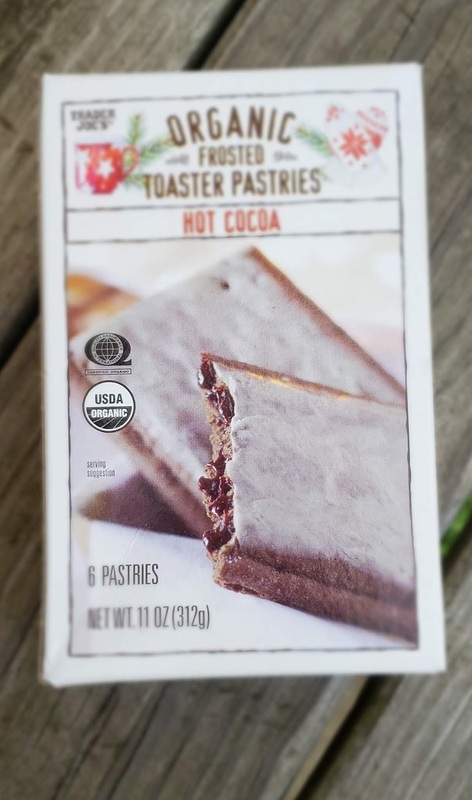 It's been a long time since I've actually consumed a name brand Pop Tart so direct comparisons are going to fall flat, but I'd rate the TJ's toasty tarts as at least equal to if not better than their more famous counterparts. Maybe it's the word "organic" playing mind tricks. You never know...but I know you can find these now at TJ's for $1.99 for a box of 3 dual foilpacks (6 tarts total) which strikes me as a good deal. Need more frosting, though. But for a first taste of things to come, not bad, not bad at all. Hey Russ, there's a typo in your review. In that 2nd paragraph, pretty sure you meant to type "basically awesome," whereas now it just says "basic." I hope they do a peppermint flavor for the holidays. I don't think we haven't seen an candy cane toaster pastry yet. I know Pop-Tarts did chocolate mint but an candy cane flavor would be nice.